King Solomon was famous in history for, among other things, his great treasury of gold. His palace was adorned with gold. His throne was gold. His cups and dinner ware were gold - even his armor and shield were gold. One of Solomon’s chief sources for this gold was a place southeast of Palestine known as Ophir. Shrouded in the mists of early times, not much is known about Ophir except that it was the great conduit for Solomon’s gold. It was not surprising then, that James Veitch & Sons named their first Cattleya hybrid that had a stunning, bright yellow color, Laeliocattleya Ophir – the cattleya from the ancient land of gold. Veitch’s chief hybridizer, John Seden, had taken the pollen from a fine Cattleya dowiana aurea and put it on a small yellow Laelia xanthina to make Lc. Ophir. The cross was essentially yellow-gold on yellow-gold. Veitch presented Lc. Ophir to the orchid world at a Royal Horticultural Meeting in London on October 29, 1901 where the plant received an Award of Merit and considerable praise from the judges for its color. John Seden was already a famous hybridizer of orchids when his Lc. Ophir came along. He had bred the first rich dark purple Cattleya hybrid, Laeliocattleya Callistoglossa (L. purpurata x C. warscewiczii) which flowered in 1882, and Lc. Canhamiana (L. purpurata x C. mossiae) which flowered in 1885. 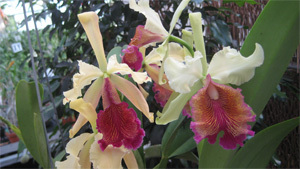 He had introduced orchid growers to brassocattleyas with his Bc. Digbyano-mossiae in 1889 and two of his crowning achievements were the dark, heavily-scented, purple, Cattleya Fabia (C. labiata x C. dowiana -1894) and C. Enid (C. mossiae x C. warscewiczii 1898). Having conquered the world of large lavender Cattleya hybrids, Seden now plunged into yellow hybrids with Lc. Ophir. Lc. Ophir had such a bright yellow color that it soon became the starting point for a host of important yellow hybrids beginning with Laeliocattleya Thyone (C. dowiana x Lc Ophir) in 1912 and Brassolaeliocattleya The Baroness (Bc. Mrs. J. Leemann x Lc. Ophir) in 1913. Lc. Thyone x C. dowiana produced the famous yellow, Lc. President Wilson, in 1918. Lc Ophir was such a success in breeding yellow hybrids because L. xanthina was genetically dominant for yellow color and passed this dominance on to its hybrids. Although C. dowiana’s yellow was highly recessive, the two parents together seemed to re-enforced each other’s color and bring out more brightness in the progeny. A breeder could certainly count on a solid yellow input into a new hybrid when he used Lc. Ophir in breeding. Lc. Ophir was such a popular parent for early yellow hybrids that I found it surprising that I could not find pictures of it in the literature when I first studied the hybrid some years ago. I had never seen a plant of Lc. Ophir in the 60 years I had been growing cattleyas, which was also surprising, and it did not appear in the inventory of the Dixon collection in 1930 or commercial orchid catalogs of the 1930s. Since you cannot really get to know a flower with just written words, I had to remake the cross if I wanted to see what it was like. In July 1996, I remade Lc. 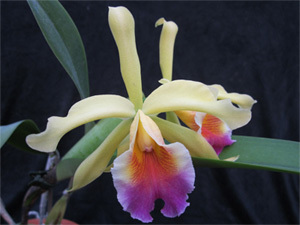 Ophir using Laelia xanthina as the pod parent as Seden had done. The seedlings grew unusually fast – a characteristic I find typical of L. xanthina crosses with large-flowered Cattleya species - and the robust plants began flowering in less than six years. The plants all produced very similar flowers with a few varieties having more intense yellow petals and brighter purple lips. The plants were vigorous growers and very free flowering –some even blooming in 3 inch pots. They had 3 to 5 flowers on a flower spike which were intermediate in size between the parents and they were charming. They often flowered twice a year, once in April and again in November and they had a delightful fragrance. Although the petals of Lc. Ophir come forward -against the advice of most orchid judges- the flowers are so delightful that the position of the petals does not seem to matter. The hybrid is a wonderful re-discovery that made me realize that some of the earliest hybrids are often more exciting than many of our newer introductions. Lc. Ophir is certainly a smiling welcome to the land of orchid gold and I suspect that even Solomon would have enjoyed having a bouquet of it in one of his golden vases.